Super producer, No I.D., shares memories of helping create JAY-Z’s 13th studio effort 4:44 on the album’s anniversary. Where does 4:44 rank in your legacy? It filled some gaps that I thought I had in my career. I didn’t set out to do it but but I always had a goal to do an album where I was the sole producer. I know Jay is listed [as a producer] but I consider him the artist. So it was great to do an album without co-collaborators. And it also hit milestone because I like to be part of projects that have meaning past sales, numbers and things like that. When did JAY-Z present the “4:44” concept to you? This was the first song we recorded. The funny thing is I had [originally] brought it to him as a concept for the entire album. Kind of like Kill Bill but kill JAY-Z. And it just ended up just turning into the first song. I went through an exercise the year before where I was just doing hundreds of beats and when you do that many, you stop doing the things that you’re naturally inclined to do and you start expanding. It was just a process of expansion and experimentation that led to that beat. On the proper 10-song album, Jay is credited as co-producer on five of those songs because he basically made a playlist of songs that he listened to at his house and it was in the spirit of the soundtrack that he wanted to capture. So I just started sampling songs off of that playlist that he gave me. It was a time where I didn’t have to go through my judgmental process. I just tried to do an idea with every song on the playlist and that idea [on “Story of O.J.”] just happened to jump out. Once again, it’s a lot of experimentation with the samples. One interesting thing that I compartmentalized all the way after this project is Jay does not rap about things that are not true. I wanted him to tell stories but of course, he only wants to tell true stories. He really doesn’t make up imaginary songs. He won’t write a “Children’s Story” like Slick Rick or like how Biggie had funny, great stories. But I knew he’s an amazing storyteller so I think “Smile” is about all these different things not being right according to people and the fact what a smile represents when you think things aren’t what they are. And how a specific person’s smile can mean something to you. It was all metaphoric. Everything is still awesome! With [the Stevie Wonder sample] being so obvious, my portion of the work … I really wanted to approach it as an art project. Get into the artistic detail. That’s like a simple song that needs nothing else to be great. But to reinterpret it or give it some edge or futuristic vibes. That was the goal when I was flipping the sample. This sample was another one that was on the playlist and as I was chopping it, I heard a part that sounded like something else. Another thing that I was doing was trying to make words that people didn’t say occur. And when that phrase “their eyes” kind of occurred, I just thought it was appropriate because I know Jay. I know how he thinks somewhat and how he reads body language — and he has body language himself. A lot of this was literally the soundtrack of him and you know how the eye can’t see itself, it was just my job or others to tell him about him and he would immediately run with it … I would agree that it’s the most slept-on song on 4:44. When we first started the album, we kind of agreed without agreeing that the album would not be a Lemonade response. In certain ways, we were going everywhere — but there! And then one day, [Young] Guru told me that he had some lines that he had written which wound up being some of the bars to the song. 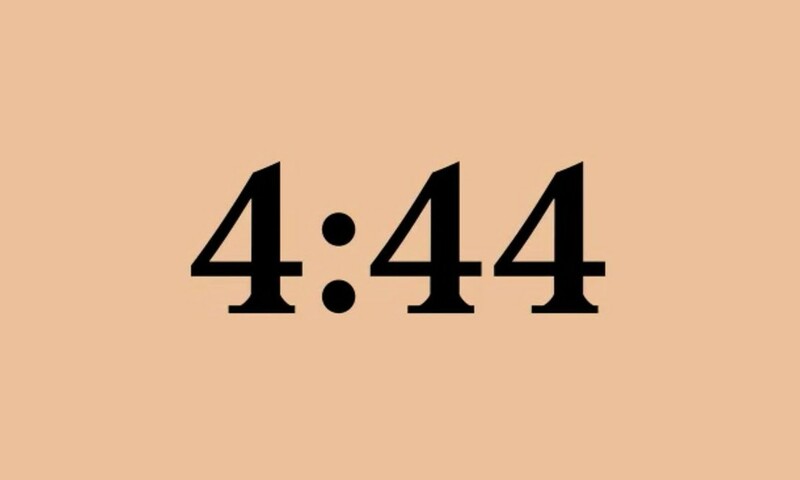 And I was like, “If we’re gonna go there, let’s go there one good time.” And [“4:44”] is one of the beats that I felt had a lot of pain and soul and that’s one of the few beats that I didn’t try to do any tricks. It’s just kind of straight up. If someone was trying to recreate the beat, it wouldn’t be as difficult as others on the album. But as the story goes, I kind of made it knowing I wanted to box him in because I knew what the song was already saying. And it just spoke right into what he said. And I just looked at him like, “What’s up? !” And he knew what I meant. He was like, “Whatcha mean, what’s up?” and I asked, “Whatcha gonna do?” And he went in. The song is a crown jewel in my opinion because it’s the song if a person had something that bothered them and you could say something to relieve that tension. I would say as a human being, he was in a better place. This is the best beat! And I’ll tell you why I think so. As many times as [the Sister Nancy sample] has been used, I wasn’t supposed to be able to get a good version out of that. That’s a challenge to take something people have used for years and years and create a new expression for it. [The sample] definitely wouldn’t have been my choice but again, it just wasn’t about me. Ultimately, we’re scoring a human being and his thoughts. And there is no wrong when you score a thought properly. Sometimes people write music to what the beat is saying and there are times when you make music to what the person is saying — and that’s what [“Moonlight”] was. And that’s what makes it work. If you just have that beat sitting around by itself, you hear it like, “Eh, it’s cool.” But when you put that thought with the music, it becomes a song! So this was one where I really went digging and found a really hip-hop level sample and was trying to back him in a corner [to appease] the real rap-rap, hip-hop fans [like] we gotta give them this! And I saw it in different places on this album but specifically here, I saw Jigga. There’s this era of hip-hop in the ’90s that I lived through and I know the threads of it. We could say the beat screams “Marcy” because he rapped about it and spoke it about but it could have been any MLK! It had that feeling that made him portion that out. I wasn’t even thinking about Marcy when I made the music. I was really thinking how my producer friends would be happy I did this beat and all our rap friends would be happy he said those raps. And then he carried it the rest of the way. I look at it like scoring a movie. The person who scores properly just reads the script. There were times where I inserted myself to help bring out things but the key to that is surrounding someone with elements that caused them to use elements from their own self. It’s just all about feeling. And we’re gonna call it “Marcy” for now because that’s what he said. But I’d call it “Southside 87th Street Chicago” too! This might have been the second or third record we did. And he immediately said this would be the outro. Ironically, we were trying to do a seven-song project. The irony of it all, right? But it just kept spilling over to more songs and he loved Donny Hathaway — that’s another sample off his playlist. Maybe I make that beat and never play it for anybody to be honest. Sometimes I make beats and don’t like it. It’s 2017 and nobody’s making those jazz beats. Ultimately for the sake of art, I was personally channeling the feeling of what’s going on. And what I mean by that is “What’s Going” On is the crown jewel of Marvin [Gaye’s] catalog but “Sexual Healing” is the biggest song. And you don’t even discuss the album “Sexual Healing” is on but you know what that body of work “What’s Going On” meant. Sometimes I think albums are so ambitious, they don’t stand as bodies of work because you try to achieve so much and sometimes we need to do less. Say less. And I think this piece of music perfectly fit the concept of “Legacy.” Between Donny’s voice and the musicality when Jay says “legacy,” we bringing it into the fact that legacy means old and young. I think we could cap the album at 10 songs and to be honest, the bonus songs are the ones that didn’t make the cut. But we still felt strong enough to utilize him. Like we both love James Blake and we wanted him to be a part of it. And even the song with his daughter on it, that was one we were tackling for a long time and never got it right but we just didn’t want to lose it. It just shows where we are as artists. We know what we like; we know what we’re doing. I wanna see where this album is at at the 10-year anniversary. I really believe it’s gonna be like fine wine. I think it’s all real! We’re in this gladiator sport of music and fighting, who’s the best and who can do “this and that,” but then, 4:44 is real talk, real art, real concentrated, buoyant, deep thought. It’s not for lightweight minds walking past who just wanna dance or judge rap patterns. It’s Thelonious Monk. It’s Miles Davis. People break the rules sometimes to make [something] new.